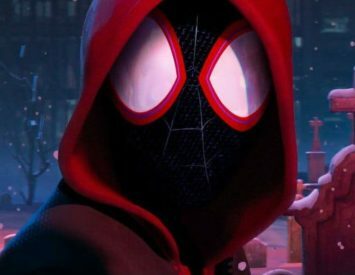 Spider-Man: Into The Spider-Verse focuses on Miles Morales, the second hero to wear the mask of the sensational, spectacular, and (you guessed it) amazing Spider-Man. He’s a young kid from Brooklyn who hasn’t quite figured out who he wants to be. He’s smart and endearing, but he struggles with making the right decisions. This is further complicated when Miles is gifted the powers of a radioactive spider and has to don a mask to be like his hero, Peter Parker – AKA Spider-Man. This dynamic is ripped right out of the comics, and as soon as I saw the fundamental building blocks of Miles’ comic book history unfold in the movie, I knew I was in for a treat. From there, our story bounces between Peter, Miles, and a host of other Spiders (more on that in a few) as they face off against the Kingpin, who threatens to destroy New York City with a dimension-warping supercollider. Can the heroes save the day or is the universe doomed to collapse into itself? Spider-Man: Into The Spider-Verse is a wildly successful animated adventure for the famed wall-crawler. With a strong understanding of Miles present at its core, the movie is able to plunge itself into high-octane action. The opening montage of Spider-Man’s exploits sets the tone and pace, and there is a particularly thrilling fight in the woods of upstate New York that had me on the edge of my seat. Spidey excels in animation, as evidenced by the huge catalog of animated TV shows he’s had over the past 50+ years. His manic fighting style is endlessly exciting and the movie moves at a fast pace to convey a sense of chaos and danger. Of course, Miles isn’t alone in this fight. As much as this is a story about him learning the ropes, this is also a story about Peter reflecting on a lifetime of being Spider-Man, and how that’s impacted his life as Peter Parker. As it turns out, being Spidey has put a strain on the relationships in his life, and he has to come to terms with accepting responsibility for his actions as a friend, partner, and nephew. This is a dynamic many comic fans will recognize, but it has never been fully realized in any of his cinematic adventures. Adult Peter Parker has a unique emotional journey that perfectly parallels that of Miles, and catapults him into an interesting new direction. 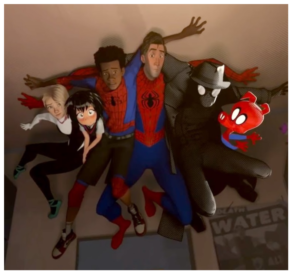 It wouldn’t truly be a Spider-Verse without some extra spider-friends, and we get to see a lot of action from Gwen Stacy AKA Spider-Woman, Spider-Ham, Spider-Man Noir, and Peni Parker, a young girl with a robotic spider as a best friend. These heroes each fight to steal every scene they’re in. Gwen’s first scene in action made me wildly giddy, as a massive Spider-Gwen fan. Spider-Man Noir is voiced by Nicholas Cage and has some of the best one-liners of the movie, all delivered with a pulpy growl that harkens back to classic James Cagney movies. Spider-Ham is a literal cartoon in an animated movie, so he’s quick to make jokes that nobody else could possibly get away with. I would have liked more of Peni, who definitely has the least to do, but has such a wild range of emotions that she made me tear up and laugh hysterically at different times. There is far too much in this movie to properly discuss at length, but I would be a fool if I didn’t mention that this movie does a wonderful job of re-imagining the comic book history for a new audience. There are a lot of elements that come directly from the comics, but these are introduced alongside bold new ideas that feel natural for the story. This movie never tries to be a perfect representation of the Marvel Universe – Ultimate or otherwise. Instead, it embraces the spirit of the comics and plays with the toys in the same way a child would, which helps the movie feel fresh and imaginative. As a longtime fan, there were Easter Eggs galore, but nothing stopped the movie from forging its own identity. Spider-Verse delivers with some of the most innovative storytelling that I’ve ever seen in a superhero movie. Nevermind that it’s an animated movie or that it’s family friendly, that doesn’t even factor into the equation. This is a movie that serves as an unapologetic love-letter to the Spider-Man mythos. I have long held onto the belief that there are two different types of Spider-Man stories; Big, absolutely catastrophic chaos (Clone Saga, Maximum Carnage, Spider-Geddon) and smaller, character-centric adventures (Kraven’s Last Hunt, Death of the Stacys). Spider-Man: Into The Spider-Verse is the rare experience that captures both of these without ever losing a sense of wild fun. It is possibly the purest Spider-Man story ever told, and is sure to make everybody believe that they too could be a hero. ﻿The views expressed herein are solely those of the writer, and not Midtown Comics. Additionally, Midtown Comics makes no representations as to the accuracy of any of the information expressed herein.